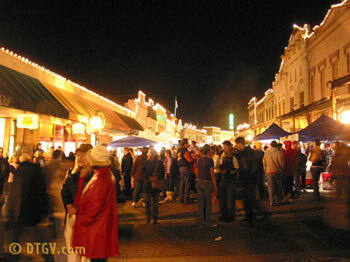 A Nevada County Christmas Tradition! Visit our FaceBook Page for more details, photos, videos and updates! 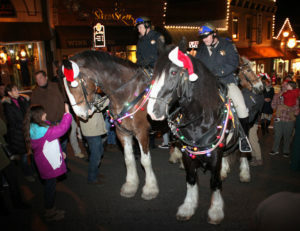 A Grass Valley Cornish Christmas view down Mill Street. 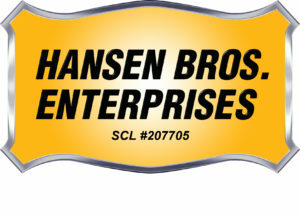 Celebrate our 52nd year with us, a Rain or Shine event! 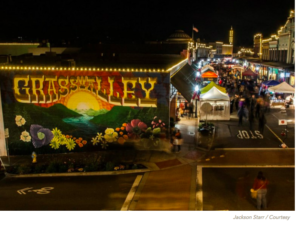 Recapture the spirit of Christmas past amid the charming surroundings of historic downtown Grass Valley, California during the annual Cornish Christmas Celebration. 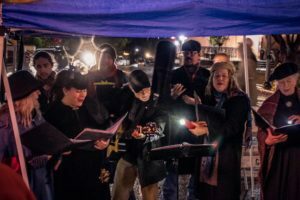 Started in 1967 as a way to preserve Grass Valley’s Cornish heritage and holiday traditions, Cornish Christmas remains one of our most popular events. 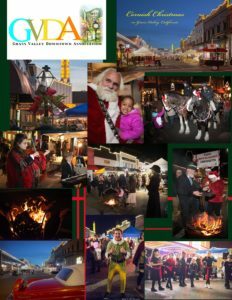 Mill and West Main Streets are closed to motorized traffic and filled with the sights and sounds of an old fashioned Christmas; carolers, jugglers, musicians, magicians, the Grass Valley Cornish Carol Choir, Tommyknocker Cloggers and of course, Santa Claus. 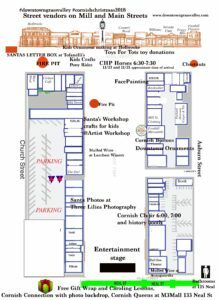 Handmade arts and craft from artists throughout California are displayed on our historic downtown Grass Valley streets. 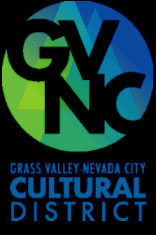 Delicious food and drink can be purchased from a number of Grass Valley restaurants and specialty food vendors. 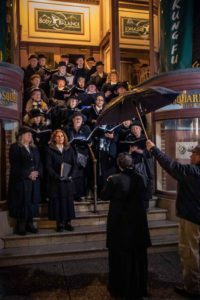 Pause at the steps of the historic Union Building as the Cornish Carol Choir performs traditional homeland Christmas carols. A long-standing Cornish tradition, some members are actually descendants of original Grass Valley Cornish Miners. 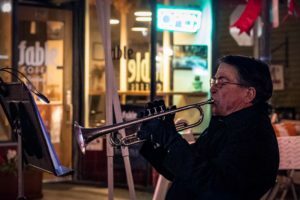 Enjoy the wide selection of holiday music offered by local Grass Valley musicians amongst the trappings of an historic gold rush town. Imagine life in another era where men and women worked hard, had little, but cherished the simple pleasures of hearty food and drink, a good song, and a warm fire with family and friends. Young musicians perform amidst ladies in traditional garb. 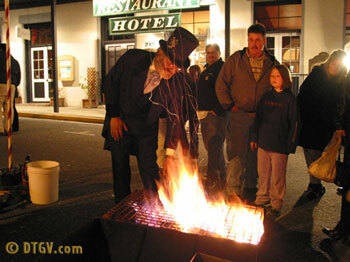 Cecil roasting chestnuts is an annual Grass Valley Cornish Christmas event! 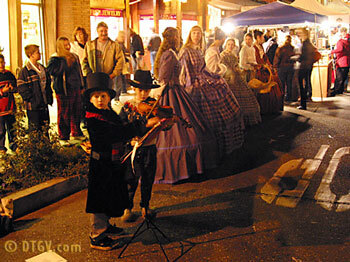 At the Grass Valley Cornish Christmas you’ll see kids and adults dressed in period costumes while you discover one of California’s best kept secrets as you shop the amazing collection of merchants that call downtown Grass Valley their home. 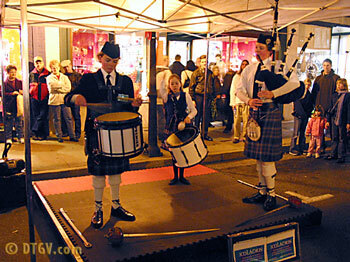 The Ingersols performing during the Grass Valley Cornish Christmas. Dine in one of the many world-class restaurants found in downtown Grass Valley. Sample local wines at one of three wine tasting rooms in downtown Grass Valley or just enjoy the simple pleasures of chestnuts roasted on an open fire. 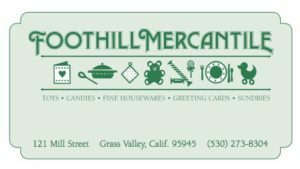 Annual Downtown merchant ornament and Cornish Christmas button at Foothill Mercantile. Holbrooke Hotel will host music and activities outside the building – Something different each week! 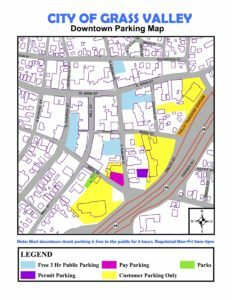 Public bathrooms will be at the Elizabeth Daniels Park-125 Neal -Street. 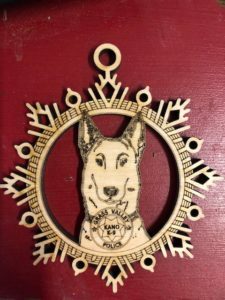 Thank you for your time and donations! We can only do this event with your help! 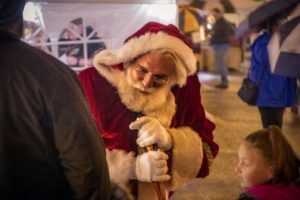 You can help make Cornish Christmas great – one of our largest free community events of the year! 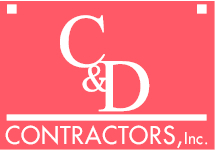 Vendor prices depend on the kind of vendor you are, and if you are doing all the nights, or some. You can choose the nights you want to vend at. We prefer if you can do all 5 nights, however individual dates are available. You must have a current permit by November 2nd to be considered for food vending. 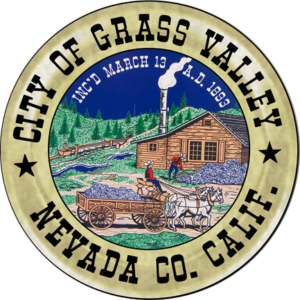 Visit Nevada County Environmental Health at the Rood Center in Nevada City to get your permits current. Power is not provided. Vendors provide their own power with batteries or Quiet generators.